CHICAGO – The story of “Little Women,” by Louisa May Alcott, has been an American institution since its publication in 1869. 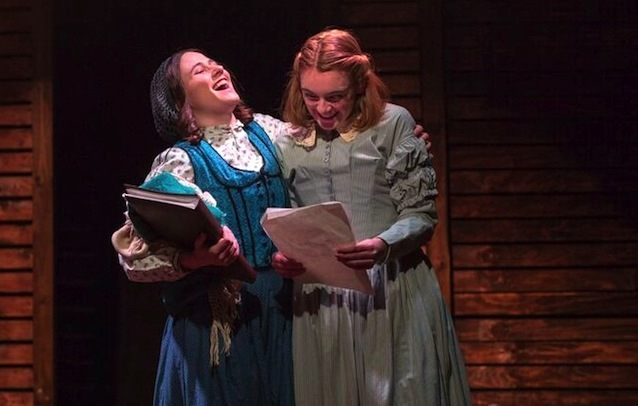 The story of four girls-to-little-women during the American Civil War, with their indomitable mother holding down the household while their father is away in the war, was a perfect candidate to become a Broadway musical. The Brown Paper Box Co. (BPBCo) is currently presenting a brilliant adaptation of that musical for the storefront stage, and its emotion, music craft and energy is nothing sort of a triumph… this small theater company that could does it again. The show has various evening/matinee performances at the The Strawdog Theatre in Chicago through February 9th, 2018. Click here for more details, including ticket information. One of the main joys of the play is how the cast brings to life the familiar characters. Although Katharine Hepburn (she played Jo March in the 1933 film adaptation) may own the exclamation “Christopher Columbus!,” Tessa Dettman’s Jo takes ownership it as well. The actors portraying Jo’s sisters – Beth, Amy and Meg – equally inject energy into the familiar story, and the portrayals of Marnee (Mother), Aunt March and Mr. Lawrence all lend their unforgettable support. “Little Women” has always been an emotional story about family, but add the incredible songs and it becomes something above pure emotion in the hands of the cast and directors (Stephanie Rohr and M. William Panek). Photo credit: Zach Dries for Brown Paper Box Co. The musical begins in that historical year of 1865, as the March family – Marnee (Denise Tamburrino), headstrong Jo (Tessa Dettman), angelic Beth (Sarah Ford), dreamy Meg (Andi Sharavsky), selfish Amy (Kim Green) and harsh Aunt March (Jenny Rudnick) – are waiting for their father to return from the American Civil War… characterized by Marnee’s ballad “Here Alone.” The daughters are in the “marrying age” phase of their lives, but Jo wants something more (“Astonishing”), and it will take the whole family to bond if they are to survive. The songs – music by Jason Howland and lyrics by Mindi Dickstein – blend seamlessly into the story, there is not the usual pause that comes into other musicals before the belting of a tune. They range from joyous (“Delighted,” “Five Forever”) to traditional (the remarkable “Off to Massachusetts,” which sounds like a Civil War-era ditty) to the deeply moving (“Days of Plenty”). As the old saying goes, you’ll laugh, cry and be touched by the proceedings, and the cast delivers the story and songs with sonic passion. The standout is Tessa Dettman as Jo March, who imbues this iconic literary character with her own truth. In a sense, every “little woman” has some Jo inside her, and Dettman found her Jo from an authentic core. The character was always unconcerned of her physical beauty (all the March woman are lovely) and Dettman was able to transform Jo to womanhood without compromising that lack of concern. In a sense, that made her more beautiful. The supporting cast is as wonderful as their lead. All of Jo’s sisters seem to spring to life from the book, and all the actors play their characteristics to perfection (Beth even plays the piano!). Ken Rubenstein, as mean Mr. Laurence, properly softens when confronted with Beth’s musicality. The “boyfriend/fiances” (Dwayne Everett, Will Kazda and Matthew Fayder) have both diversity and charm in their energies, along with Marnee and Aunt March… who are just as you’d expect them to be, both in character and singing voice. You’ll love this cast. Two small complaints… the play is done “between the audience” and when a character is turned away it’s hard to hear them, and the sensational piano score rendering by Justin Harner sometimes drowns the singer… both are an acoustics thing. I just didn’t want to miss a word or song from this show, the best way I can think of to ring in 2019. ADDENDUM: Brown Paper Box Co. is generously offering free tickets to the show for federal workers in and around Chicago, who are currently furloughed as a result of the government shutdown. Federal employees with a valid government ID can enjoy a free ticket to select performances on the following dates/times: Monday, January 21 @ 7:30PM , Friday, January 25 @ 7:30PM, Saturday, January 26 @ 3:30PM, Saturday, January 26 @ 7:30PM, Sunday, January 27 @ 3:30PM, Thursday, January 31 @ 7:30PM, Friday, February 1 @ 7:30PM, Saturday, February 2 @ 7:30PM, Sunday, February 3 @ 3:30PM, and Thursday, February 7 @ 7:30PM. Seats are based on availability and tickets must be acquired in person at the Box Office (at Strawdog Theatre address below) the hour before the preferred performance. One (1) free ticket per government ID. Click the link in the first paragraph for ticket availability. 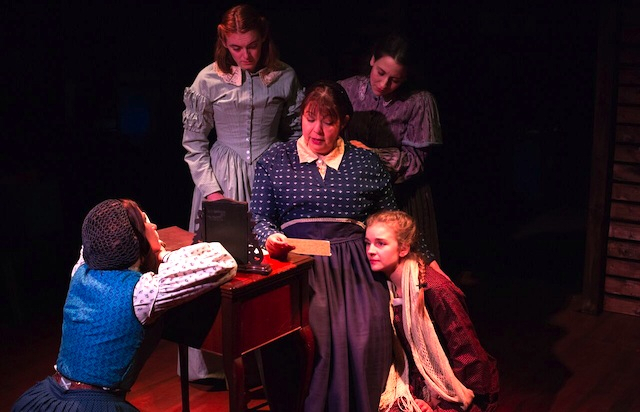 Brown Paper Box Co. presents “Little Women: The Musical,” in both matinees and evening performances on various days through February 9th, 2019, at the Strawdog Theatre, 1802 West Berenice Avenue, Chicago. Featuring Tessa Dettman, Sarah Ford, Kim Green, Andi Saravsky, Denise Tamburrino, Jenny Rudnick, Dwayne Everett, Will Kazda, Matthew Fayder and Ken Rubenstein. Book by Allan Knee. Music by Jason Howland. Lyrics by Mindi Dickstein. Directed by Stephanie Rohr and M. William Panek. For more information about the Brown Paper Bag Company, click here.